In a medium saucepan over high heat, melt 1/3 cup butter. Stir in brown sugar and cinnamon. Bring mixture to a boil, reduce heat and simmer for 3-4 minutes until thickened. In a medium bowl, combine mixture and popcorn until fully coated. In a large saucepan over medium heat, warm chocolate chips until mostly melted. Add remaining butter and marshmallows. Continue stirring until completely melted and combined. Pour chocolate mixture over coated popcorn and mix thoroughly, working quickly before chocolate hardens. Pour sprinkles on a plate. Using your hands, scoop a handful of popcorn mixture and form into a ball. Roll in sprinkles and place on a cookie sheet. Repeat with the remaining mixture, place cookie sheet in the refrigerator. Popcorn balls will be ready to serve in 20 minutes, or cover tightly and refrigerate overnight. TIP: If popcorn mixture starts to cool down before you’ve finished making the balls, microwave for 15-20 seconds. 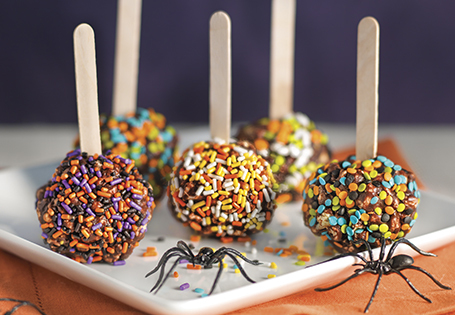 Place a popsicle stick in the top of each ball before refrigerating for a fun handheld treat.